Yes yes, I survived my first day of 8th grade! XD! It was pretty chaotic, but I got to meet up with my friends again, and all my teachers seem pretty nice! I even have my dad as my history teacher, XDD! Aaaand now I'm posting this at 1:03 because I took a nap after school. XD! Welp, honestly, it wasn't too eventful! I've been at that same school for 2 years now, not including this year, so I kinda know how everything works, XD! Anyways, if you haven't seen my latest screenshot dump post, you can scroll down and read that for some entertainment, XD! You Guys: Uh, where is she? You Guys: Maybe she's just... late? To... walk through the door? You Guys: Okay, that's it! You Guys: YOU'RE SUPPOSED TO BE POSTING RIGHT NOW!!! Me: UGHHHHH I HAVE SCHOOL TOMORROW!!!! Wow, that intro was longer than usual! Anyways, yes, I'm back with another post (although turns out when I said "(most likely tomorrow)", I meant in 4 days... eheheh...), and yes, I do have school tomorrow. I have no idea if I'm looking forward to any of 8th grade or not. Well, okay, I guess I'm looking forward to the choir stuff and seeing my IRL friends again. Oh yeah! Also, I just wanted to let you all know that Hurricane Harvey (although it downgraded into a tropical storm) has officially passed by (although if it's completely over for all of Texas yet, I'm not sure), and my whole family is just fine! We didn't even really get any flooding here! Houston, on the other hand... uh... is VERY flooded. But enough about all that. Let's get on to the post! I have absolutely no ideas for a post at the moment, so I'll use this as a screenshot dump, because 95% of my files are pictures from Animal Jam. Okay, I'm gonna start now. XDD! Um... I have no idea why Tom must do "the bloom moon ball". I also have no idea what that is. A black worn or a grey worn? Okay, I don't remember those pet bunnies being so... big! 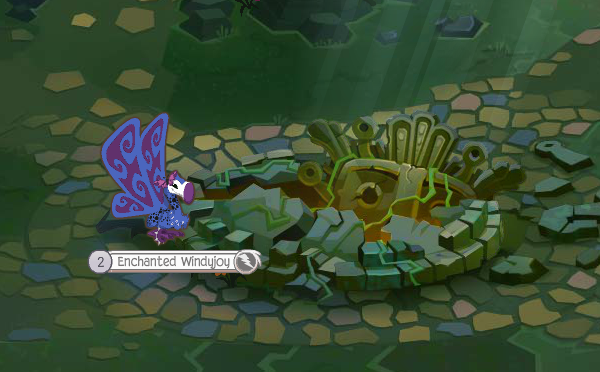 Also, when they blink, their eyes disappear completely. Thanks for the demonstration, green bunny. Whoops! 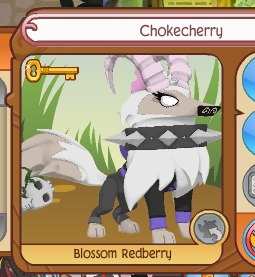 Looks like one of the spikes doesn't really wanna stay on the collar! And THIS is what happens when you put a Ferocious Feline Tail on an arctic fox, I believe. 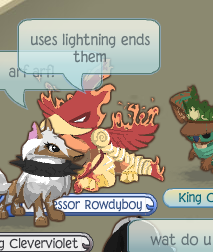 Hehe, I saw people screaming about how people called "Approx" and "Viofy" were in Coral Canyons, so I went to... Viofy's den, I believe, and both of them were there! 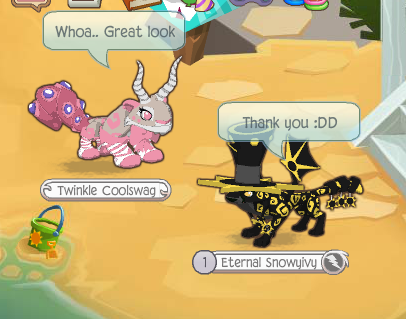 They're the flamingos- Approx is the golden one, and Viofy is the black one with stars! I had no idea who they were at the time, but now I kinda do, XD! 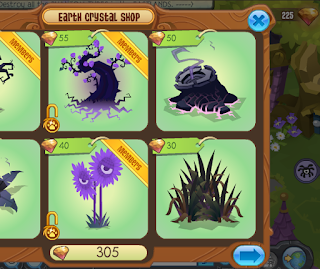 Woah, wait a minute AJ... do I have 305 Earth Crystals, or 225? This glitch happened a day or two ago, and with pretty much ALL of my animals that can go underwater. 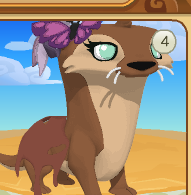 Some land items didn't appear on them- for example, my otter is supposed to be wearing a Rare Leaf Necklace- and some land items and sea items overlapped! Just look at that Butterfly Hair Bow and that Anemone Head Bow! MAKE UP YOUR MIND AJ! IS IT UNDERWATER OR ON LAND!? 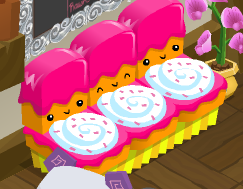 I saw this Cupcake Couch-thing in someone's den (I forget who's den it was exactly), and I THINK it's a promo item. Either way, IT'S SO KAWAII!!!!! This person said something about redheads right before this. So, apparently, people with red hair have a "burning pasion." AHHH THE LLAMA'S FACE IN THE PHOTO BOOTH IS THE BEST THING EVER, XDDD! Here's another item that I think is a promo one. I'm guessing this comes with that Dress-Up Closet toy? Oh, yep, looks like it does! Strange- I don't see this item around very much at all! 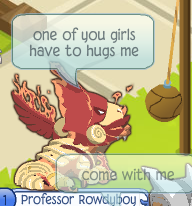 Woah woah woah, it's just Animal Jam dude! Heh, I spawned into a world and saw this seal going "It's game time" and dancing. XD! 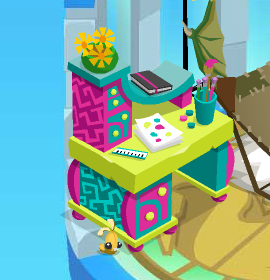 This promo item, the Stationary Desk, is from the AJ stationary set! 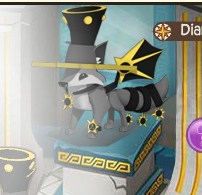 Ahhh, I want this item SO BADLY! 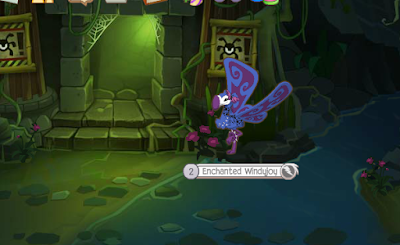 Oh... okay, I just noticed that dragon-wing thing back there. Hm... I dunno what that is! Thought it was just a Clothes Rack at the time! YESSSSS I WANT THIS ONE TOOOO!!! 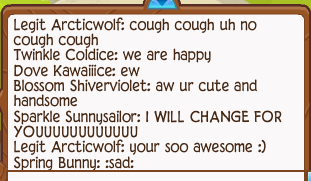 The chat bubble in the middle of this picture is from the arctic wolf in the very first picture. Awww! The world needs more people like this!! Whew! It feels good to finally put those pictures to good use! I hope you all enjoyed this post! I'll be back tomorrow to say how my first day of school went! Hopefully it'll be good, XD! Anyways, remember to PARTY HARD, BE KIND, and JAM ON, everyone, and I'll see you all soon! Hello everyone! Before I make an actual post sometime this week (most likely tomorrow), I just wanted to warn you guys about something that may or may not affect my posting schedule. You Guys: You mean the one you don't have? I live in Texas, and, down by the Gulf Of Mexico, there's a hurricane heading for the shore. No no, don't worry, I don't live by the coast- I'm further up, and I don't live by any huge bodies of water, unless you count lakes! XD! But anyway, a lot of people are worried, because the hurricane is going to cause a lot of rain, and there's a very good chance it's going to flood where I live. Not a life-threatening flood (as far as I know. It's flooded where I live before. ), but still pretty bad. There's also a chance that the power in my town could be off for 3 or 4 days. So, if I suddenly disappear and become inactive in the community for a few days, don't worry, I'm okay! It just means that the power is out, and I'm not able to get on my computer. Eek. I'm a bit worried- natural disasters freak me out- and a news website said that it was strengthening into a Category 3 hurricane. Right now, I THINK it's considered a tropical storm (well, Google seems to think so), but I'm pretty sure that won't last long. Everyone down by the coast had to evacuate and come up to stay in the towns that we live in and are close by, until the hurricane passes and they can go home. Once more, don't worry if I'm active one day and silent the next! I don't know what problems this hurricane will cause, but let's all hope that it's not many! Hello ladies and gentlemen, boys and girls, children of all ages! Okay... so no one reading this is a lady or gentleman, really. As in an adult lady or gentleman. Just ignore that. XD! Anyways, today, I'm making this post to tell you guys about, like the title says, a final announcement. First off, I hate to remind everyone (including myself) of this once more... but a lot of us will be returning to school in about a week or so. *Shudder* School. Mine is basically an overcrowded one-story building where 99% of the kids there go around cussing and talking about inappropriate things. So yeah, during the school year, I'll obviously have homework and stuff to deal with, which means that I may get behind when it comes to posting. I'm actually sorta worried, because last school year, I felt like I was drifting away from the AJ community and all the bloggers for a while, mostly during the middle of it. I'm going to try my hardest to make sure that doesn't happen again, but, of course, we'll have to see what happens in the future when it comes to real life. But yeah... my posting schedule... probably WON'T be a schedule at all. 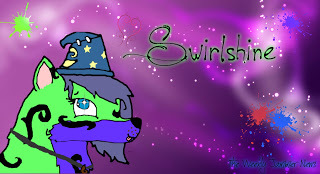 You Guys: Swirl, it never was. Now, there's one more matter that I wanted to discuss before I end this lil' post. As most of you know (since I told you in a post about a month ago), Jamaasian Middle is nearing its end. Well... the end is here. The last two chapters of JM will be posted tomorrow. Why two chapters on the same day, you may be asking? Well, the VERY last chapter will be shorter, kinda like an outro of sorts. I didn't feel like it was worth waiting another whole week to post a few paragraphs, so I'll be adding it onto Chapter 34 on Sunday (even though you'll all probably see it Monday). Man, it'll be so odd, not posting a chapter every week. Hopefully, though, you all enjoyed this story of mine! It was actually the first ever long-ish fanfiction I ever posted online, and I put so much work into every single chapter to make it awesome! Until tomorrow, remember to PARTY HARD, REMEMBER JM, and JAM ON! You Guys: STILL no exclamation points? You Guys: Are you still not feeling good? Yup, that's right everyone! I'm feeling completely normal again, even though my "normal" is crazy and random, XD! So THAT means I'm back for another "normal" post, hehe! Okay... so, it may be more of a mini-post... but I still wanna do this! XD! 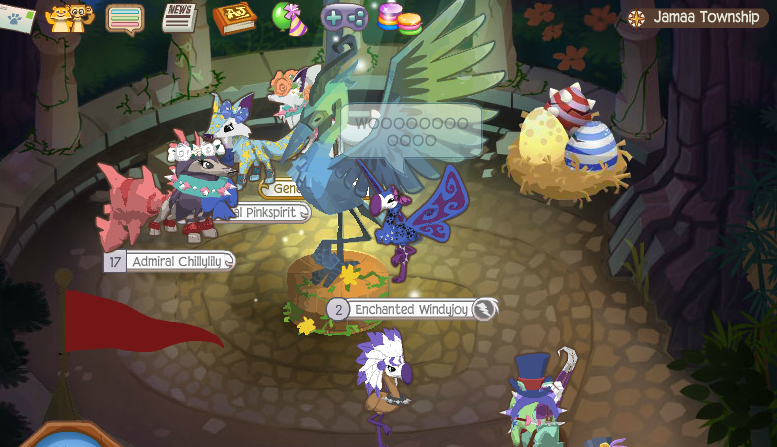 Anyways, today, I went on Animal Jam to go to Kraft's party... and, uh... Jamaa looked totally normal. 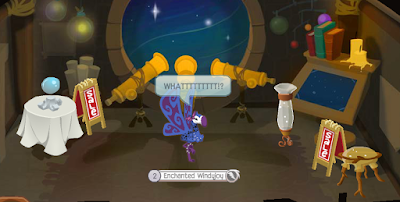 I thought that AJ had somehow forgotten that it was Thursday and that Jamaa was supposed to be dark for the eclipse and everything, but then, around 11 AM, it asked if I wanted to be taken to a newly updated world (I hadn't clicked anything but it took me there anyway soo... XD!). Yay! Jamaa Township was dark! I went up to Mira statue, and... eheheh... 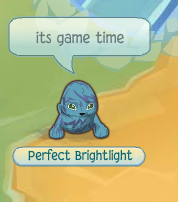 Animal Jam logic... there are still sun rays shining onto it. Maybe AJHQ did that intentionally, to symbolize how Mira is kinda like a light in the darkness for Jamaa, or maybe they just didn't want to edit those sunbeams out. We'll never know. XD! I went into the Temple Of Zios next, and I found that the Adventure Base Camp passageway has an eerie green light shining from it. DUN DUN DUNNNN! XD! Anyways, I decided "Hey, Play Wild's Coral Canyons was unchanged, but maybe Animal Jam's looks better! I'm gonna go see!" Yeah... Coral Canyons wasn't altered at all. Neither was Crystal Sands, or the Canyons Pathway (aaand I didn't check Kimbara, Mt. Shiveer, or Sarepia, eheheh) I was disappointed, because I REALLY wanted to see what the sky in Coral Canyons looked like at night. Oh well... guess we can't expect too much. 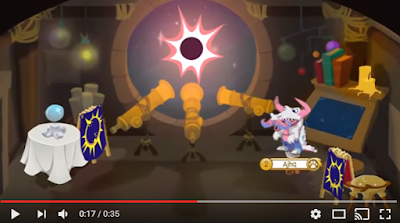 Seems like the Chamber of Knowledge may be holding some special eclipse items, judging by those tapestries over the sale signs! I don't know for sure, but I'd love for them to sell some limited-edition den items there! So yeah, I was pretty disappointed at first. However, then, I found out that there was a brand new armor set being sold in the Diamond Shop- the Eclipse Armor! 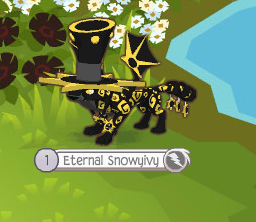 It all looked super awesome, so I immediately bought all of the pieces to it and updated my eclipse outfit, XD! Oh yeaaaah, those wings are EPIC! ... 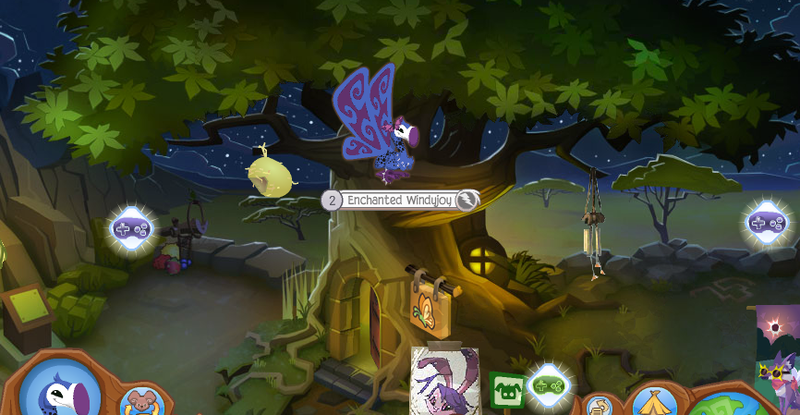 Animal Jam had added an eclipse sun-thingy! Good thing I was my lemur with my Rare Sunglasses on at the time, XD! That's all I've got for now, everyone! I'm gonna go and work on some minor changed to the blog now! :D Until my next post, remember to PARTY HARD, BE KIND, and JAM ON!!! Just wanted to say, for those of you that don't know already, Kraft will be having a birthday party on the 17th! You can look in the comment section of my latest post, "The Psychotic School" to find the invitation she made! I was told to help spread that word, so here ya go! XD! You Guys: WHAT ON EARTH IS WRONG WITH YOU!? You Guys: You didn't put ONE exclamation point in those sentences you just said! You Guys: And you ALWAYS use exclamation points! 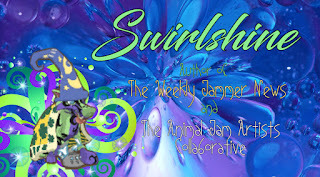 You Guys: *Shakes me* WHAT HAVE YOU DONE WITH SWIRLSHINE!!?? You Guys: CALL 911 ASAP!!! SOMEONE HAS STOLEN HER CRAZINESS AND SHE NEEDS MEDICAL ATTENTION!!! Me: No one "stole my craziness"- I just don't feel to good at the moment. Yeah, so... that happened. XD! Ah, THERE'S the exclamation point! And another! And- okay, I'll stop now. Anyways, like I said above, Chapter 33 of JM was posted yesterday, so be sure to check that out! Also, what I said was true- I'm not really feeling too great at the moment. I don't feel sick, just kinda... off. I dunno. Hopefully I'll be fine tomorrow. You Guys: Um... Swirl? What are you doing? I've been wanting to use that intro for a while now, XD! Anyways, let's get on with this post, shall we? I went to the Back-To-School Party (or is it the Schoolhouse Party now? I know it is on Play Wild, but I didn't check on AJ.) on AJ yesterday... and ohhhh man, some seriously hilarious drama broke out as soon as I arrived! You Guys: SWIRL JUST TELL US ALREADYYYYY! Okay, okay, fine! I'll start from the beginning. I replied "No... I'm a bunny. An AJ bunny. And just because I wear these glasses doesn't mean I'm a nerd." 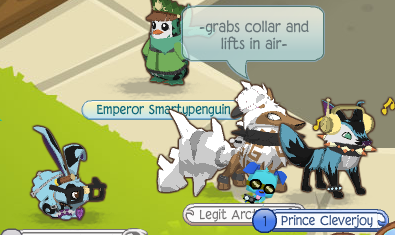 I finally realized that this person was roleplaying. 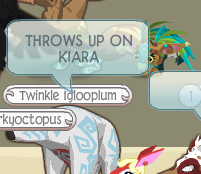 I just replied with "O.O", because I was NOT roleplaying. 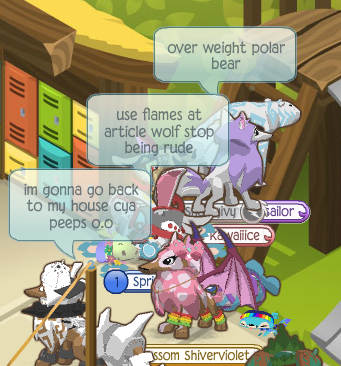 Suddenly, this arctic wolf, who was another roleplayer, came up and said something like "You have no right to do that to her! D:(" He decided to "save" me from the "bully". "Get away weirdo" vs. a karate kick. Hmm. Then, all of a sudden, someone hit someone else with a sword. Yeah... uh... pretty sure most school roleplays don't involve weapons. The battle rages on... dun dun dun! 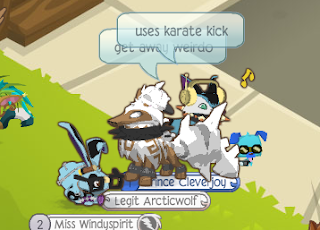 The arctic wolf, without warning, "picked me up" and put me in a classroom, closing the "door" behind him, then continued fighting. Yeah... this was basically the chat for a long while. People were watching and screaming that kids were hurting each other, as you can see. 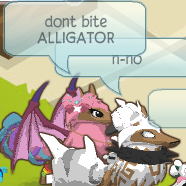 By now, the coyote had decided to randomly change into some kind of... phoenix crocodile. 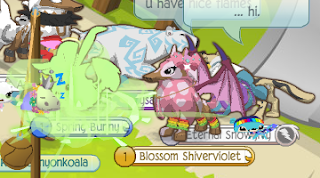 Yup... um... he/she had flaming wings now. And was growling and scratching. And the arctic wolf was throwing her into a building. Apparently, some fox was, uh, eating the "ended" wolf. The tan-and-white arctic wolf, who had seemingly stopped fighting, replied "Not anymore, if you haven't noticed." 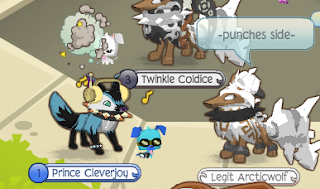 Another arctic wolf had also joined the roleplay- the one with the pink Wings and Sparkly Head Bow. And this is just pure chaos right here. 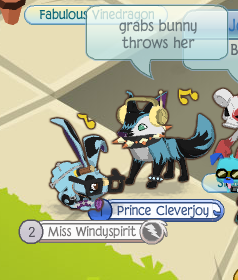 First of all, creepy, gorey fox, I didn't even see anyone ASK what was wrong with you. There's also a purple-and-white arctic wolf, who's mad... at something, a barfing polar bear attacking people, another arctic wolf (the one with wings. AT A SCHOOL.) 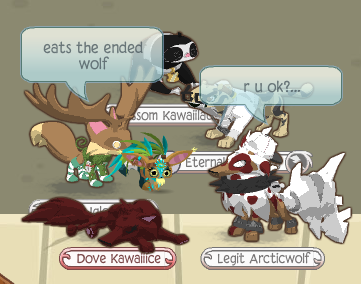 saying "I'm not ok" to anyone who was listening, and my savior arctic wolf dude, who was saying goodbye. ...And a sloth who wanted friends, apparently. 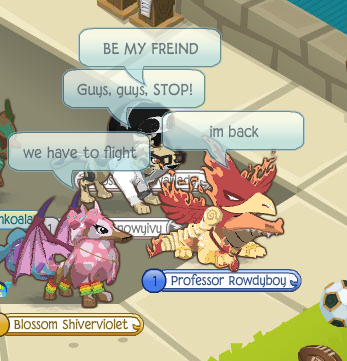 They were fighting again, so I stepped in and tried to get them to stop. Yeah, it, uh, didn't work. "Woah woah woah!" I typed. "You were literally attacking everyone a minute ago. Now you're saying they're cute?" 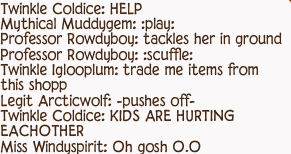 I REALLY don't think this person understands roleplaying. And yet, the pink arctic wolf with the Wings blushed and thanked them. Aaand we're back to the powerplaying. Yeah, uh, no one really cared that this phoenix croc had "ended" them. Hehe. Well, no wonder they were acting so odd! They're some kind of... firey... alien-croc-thing. 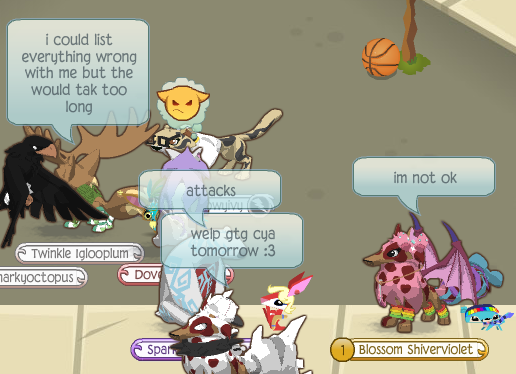 Anyways, the pink arctic wolf replied "Okay. What if I don't take you?" Phoenix Croc: "Then I will use my lightning and fire powers to destroy you all." Pink Arctic Wolf: "Oh no, don't do that to them! I'll take you." But then, the croc-person pointed out that they needed one more thing. 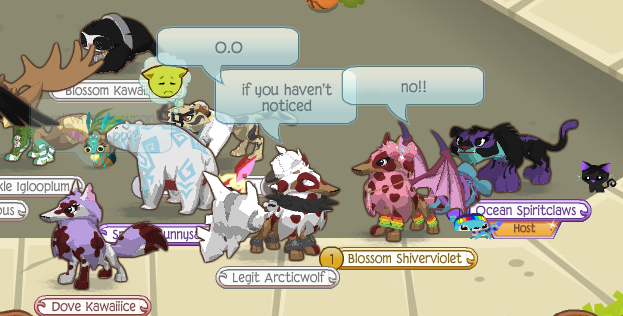 Pink Arctic Wolf: "Oh okay." 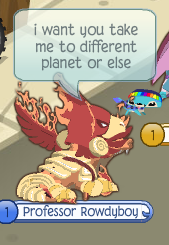 And then, all of a sudden, the phoenic croc wasn't interested in going to another planet anymore. Instead, they typed, "I'll be good if someone says something nice to me." Surprisingly, everyone started saying stuff like this. I thought they'd just ignore that croc, but nope- he/she actually got them all to compliment him/her! Ignore me saying "... hi." XD! The evil phoenix croc magically turned into a cute Spring Bunny with Friendship Armor on! Aaaand then, long story short, the purple-and-white arctic wolf insulted the polar bear, the croc-who-was-now-a-bunny used its powers on her, and after a few minutes, the party was empty. Man, what an... interesting school day. XD! So yeah, there's my story! 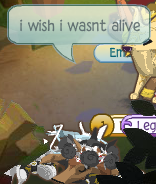 That's Animal Jam schools for ya: you get bullies, who are actually phoenix crocs, who are ACTUALLY nice bunnies, long fights, magical powers, and very, VERY, confusing plot twists. Overall, this school is by FAR... the weirdest school I have ever seen in my entire AJ life. 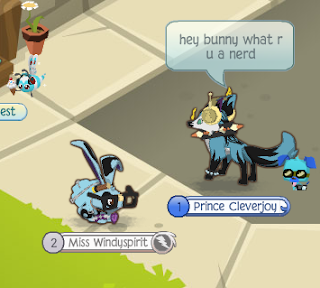 And I once visited a school that was for "magical creatures" (or something like that) . Yeah. 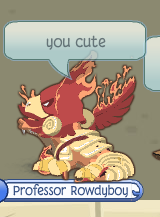 I... um.. maybe she meant the phoenix croc? I really dunno- it was so insane there that she could've been talking to one of those other arctic wolves. P.P.S. 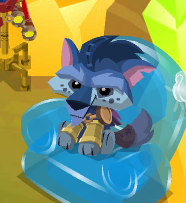 Also, the reason mah savior arctic wolf guy is in a lot of other later pictures is because he said he would leave, and then he didn't. XDD!